Karnataka health minister U.T. Khader turned up on Wednesday at a rally of farmers in Bangalore protesting against the high tension power line across Kodagu and assured that he would take up the issue with chief minister Siddaramaiah. The rally was organised by Karnataka Rajya Raitha Sangha (KRRS) headed by MLA K.S. Puttannaiah at the Freedom Park to protest against the Kaiga-Kozhikode 440 KV High Tension Power line passing through Kodagu district. 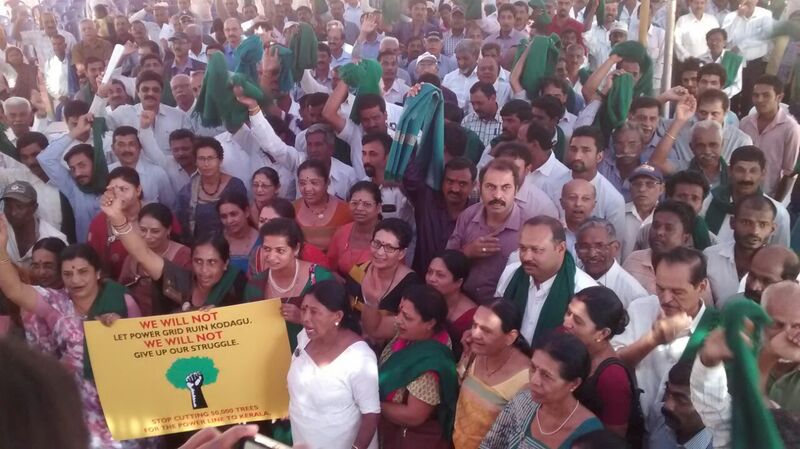 Puttannaiah urged the government to take the alternative route, instead of through Kodagu which could lead to the destruction of over 50,000 trees in the fragile Western Ghats. He noted that the planned route could lead to serious water crisis in the Cauvery basin and also acute shortage of drinking water in cities like Mysore and Bangalore. The KRRS leader warned that if the government fails to change the route of the proposed high tension line across Kodagu, the farmers would have to block roads in eight districts of Karnataka. Addressing the rally, the President of the Coorg Wildlife Society Col C.P. Muthanna (retd) said that their protest would continue till the government takes the alternative route. Among those who spoke on the occasion, include former police officer B.B. Ashok Kumar and president of Bangalore Kodava Samaja Mandeda Ravi Uthappa. Farmers’ leaders from Kerala also addressed the gathering. KODAGU HIGH TENSION POWER LINE: SIDDU-MODI BHAI BHAI!